In 1926, alongside his farming activities, he began his artistic education under the tutelage of the painter Tell Rochat (1898-1939), a former student of André Lhote. Pierre Aubert presented his first woodcut prints at the 1933 International Exhibition of Wood Engravings held in Warsaw and Cracow. At the age of 24, the young artist went on an educational trip to Paris – a must for every artist - and on to Provence. Some of his works were exhibited in the USA and at the Swiss Institute in Paris. In 1942, he became a founding member of Tailles et Morsures, a Frenchswiss group of engravers with whom he exhibited in Zurich, Bern and Lausanne, and then when the war ended, in Paris, at the Bibliothèque Nationale. By the end of the 1940s, Pierre Aubert could devote himself entirely to art. 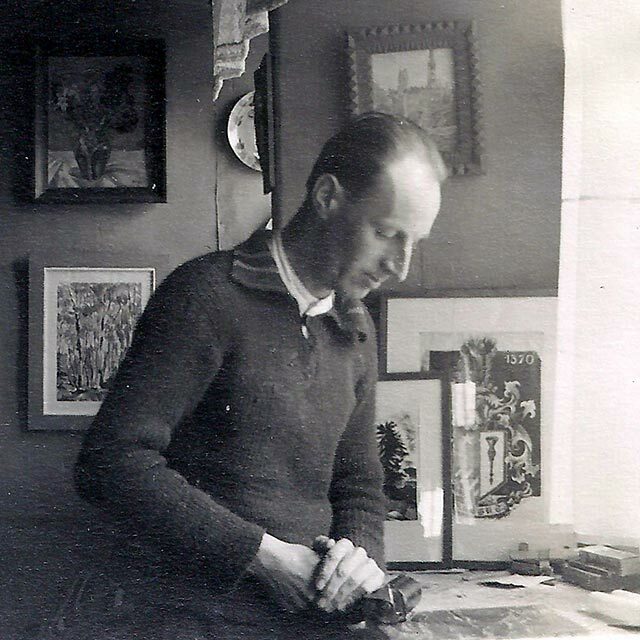 Several times a year he would visit Paris where he attended the Académie Julian and the Académie de la Grande Chaumière, and became friends with the engraver Démétrios Galanis (1879-1966). He exhibited at the Galerie Raymond Duncan, the Salon de l’Art libre, the Salon d’hiver, and the Salon des Indépendants of which he became a member. He travelled to the South of France and came back with watercolours, gouaches and drawings. In 1961, Pierre Aubert left the Vallée de Joux and moved to Romainmôtier. In 1964, the Musée d’Art et d’Histoire in Geneva put on a retrospective exhibition of his work. Several of his works entered public collections, namely, the Bibliothèque nationale de France, the State of Vaud, and the Bibliothèque nationale suisse. In 1991, four years after the artist’s death, the Musée Jenisch Vevey – Cabinet cantonal des estampes held a retrospective of his work. You can find available on Pierre Aubert’s life and works in the Shop.